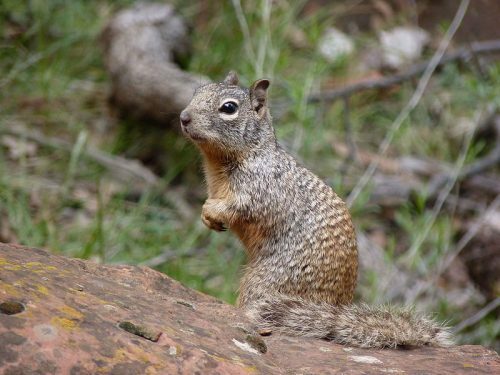 A few days ago, I saw two rock squirrels coming out of their burrow along the Isleta Drain. I grew up in Virginia, so I’m used to squirrels building nests in oak trees and eating acorns. But here in the Southwest, oaks are rare except for live oaks used in landscaping as a shade tree and the Gambel Oaks in the mountains. So rock squirrels eat Russian olives (they climb the trees to get to the fruits), berries like pyracantha, and pine cones. They also dig burrows and make nests inside of them where they give birth to litters twice a year. Sometimes, burrowing owls steal their burrows for their own nests. Their enemies are coyotes, foxes, northern harriers, and other raptors. Like eastern gray squirrels, they will raid bird feeding stations and make pests out of themselves. But hey, they’re cute and hungry.